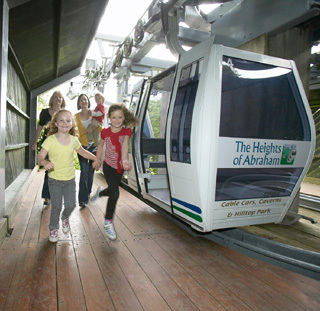 First opened in 1780, the Heights of Abraham still remains one of the Peak District's most popular attractions. Visitors travel from all over the world to experience its spectacular caverns, stunning views and beautiful woodland walks. 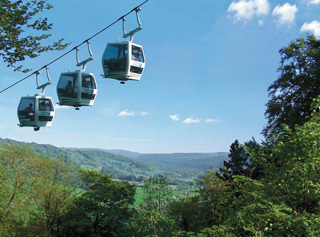 Where once the Heights were reached only by foot, today you can make the journey in comfort and safety in one of our Alpine-style cable cars - the first of their kind to be introduced in the British Isles - allowing stunning views of the Derwent Valley and surrounding countryside. Once at the summit, there's a lot to see and do. And it's all included in your admission ticket! 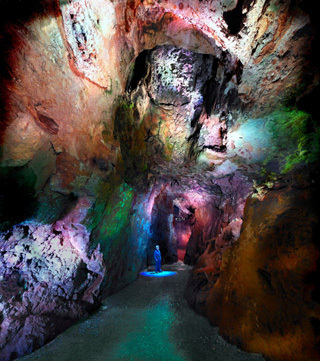 Great Masson Cavern - Experience first-hand our spectacular cavern system, dramatically lit as never before. Your guide will take you on a fascinating journey deep into the hillside, and back in time through the Cavern's long history. The Long View Exhibition - See and hear our 230 year story about why the estate has been a favourite place to visit for many generations. The Fossil Factory - A fascinating exhibition bringing to light facts about rocks, fossils and the formation of the Peak District, with a film presentation about our show caves and a chance to get 'up close' to the remains of a giant, 30-metre Ichthyosaur! Masson Pavilion includes 2 experiences. Heath and Heaven - A stunning, pictorial gallery of aerial shots of the surrounding Peak District by world-renowned photographer John Beatty, accompanied in words and poetry by Si Homfrey. Through the Lens - A film guided tour of the Great Masson Cavern - ideal for those who can't, or don't want to, go underground. Great Rutland Cavern - Our second and oldest cavern, first opened to the public in 1810. The tour gives an insight into life as a lead miner in 1675 with an 'animatronic' presentation! Climb the Victorian Prospect Tower or, for younger visitors or the young-at-heart, try the two Playgrounds or seek out the wonderful woodland walks. There are numerous places to shop, eat and drink, many selling local goods and produce. The Terrace Coffee Shop - open daily - is the perfect spot to relax with a cup of coffee, or take a light lunch. The Vista Bar & Restaurant - offers a different menu, with table service for those who choose to take longer over a meal. Both venues are licensed, and have panoramic windows allowing stunning views of the Derwent Valley. Both also open, when weather permits, on to terraces for al fresco dining. Treetops Gift Shop and Highfalls Rock Shop have an array of souvenirs, minerals and gifts for all ages and tastes. Average visit time – We recommend that you allow approximately 4 hours to ensure you get full value from your day out.